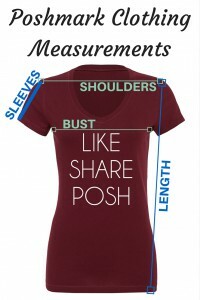 Clothing measurements are so important for many buyers on Poshmark. With the app’s no-returns policy, buyers want to make sure clothing or shoes will fit them before they buy it. 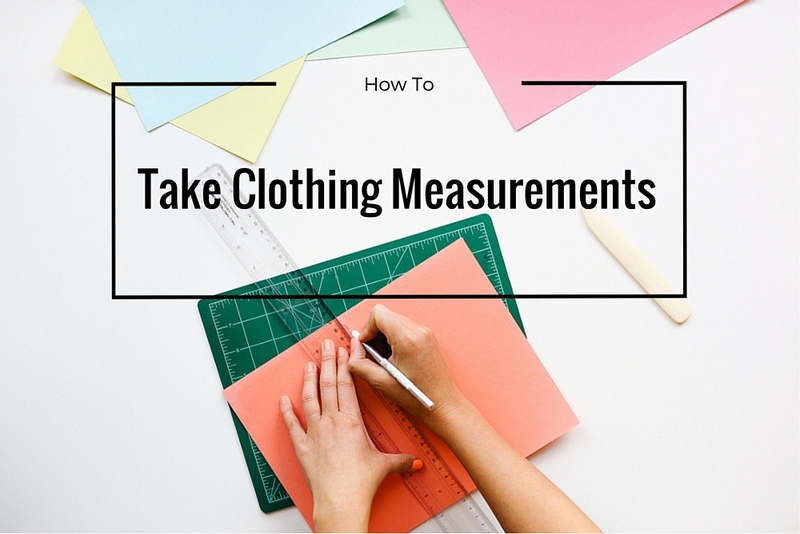 You can measure your clothes the same way professionals do and it’s super easy. All you need is an inexpensive seamstress tape measure. Although, if you don’t have one of those yet, you could use a measuring tape for the time being. The flexible tape measure will be the best option since it allows you to measure around curves more accurately. 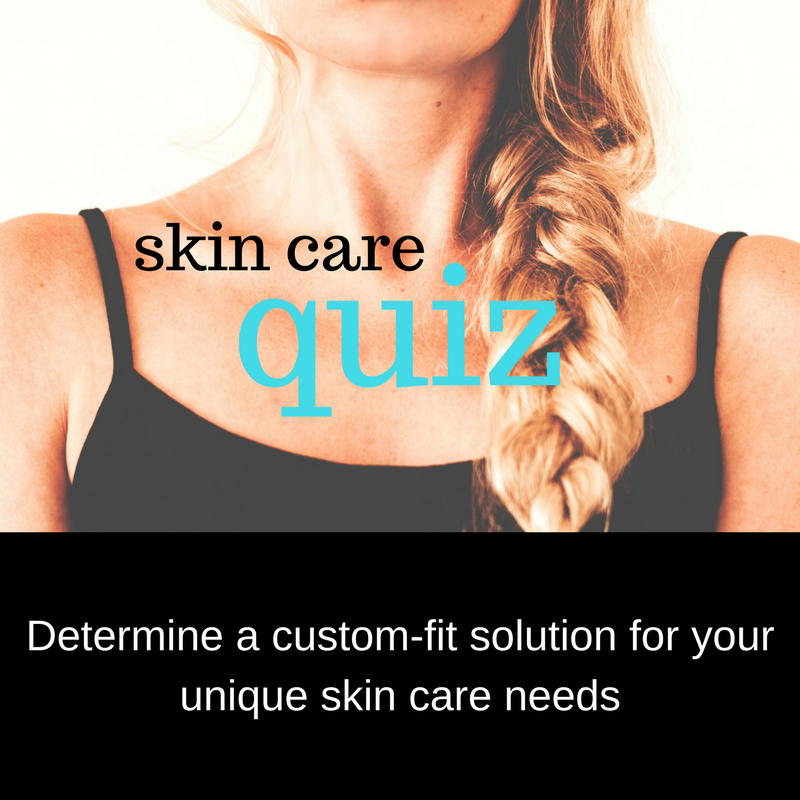 When you are measuring a garment, lay it out on a flat surface and smooth out the bumps and wrinkles. If the back of a shirt is all bunched up underneath, then you will not get an accurate measurement. So get everything as flat as you can. Because fabric is fluid (and sometimes stretches), it CAN be kind of tricky to get an exact measurement, so plan on about a 1/2 inch variance. For very stretchy materials, you could also provide a measurement range. To cover myself from any claims of inaccuracy, I usually say that a measurement is “about” such-and-such number. I really don’t want to be arguing over whether something is 15.25 or 15.5 inches. It’s close enough. The bust is probably the measurement that is asked for the most with tops. You take the measurement across the chest of the garment, from side seam to sides seam. It goes across the garment directly under the armpits, where the side seam meets the sleeve. For sleeveless tops, the measurement would be taken across the garment right under the arm holes. Once you have measured the garment straight across, you double that measurement for the actual bust size. For example, if a shirt measures 16″ across the front, then the whole bust measurement is 32″. And remember to state whether that measurement was taken with the top zipped or buttoned up if that applies. Measure directly across the shoulders from seam to seam. Your measuring tape should stay straight and may make a line slightly under the collar of the garment. Measure from the top shoulder seam to the bottom of the sleeve cuff. Remember, this is the top of the sleeve, not the bottom of the sleeve. For tops and dresses, measure length from the top of the shoulder seam (at the collar) down to the bottom hemline. Some people take this measurement from the center of the back at the top of the collar, instead of from the shoulder seam. So just make sure you state which measurement you used for the length. For pants and skirts, measure from the top to the bottom along one of the side seams. For pants and skirts, this is super easy. Measure from seam to seam across the top of the skirt. Or, if there are no seams, just from one end to the other while the skirt is lying flat on the floor. For dresses, this measurement can be a little bit tricky. It’s not quite as simple as measuring the bust because we don’t have the armpit seams for reference. Try to find the narrowest part and give the measurement across that spot for the waist. If it’s hard to eyeball the smallest part, then stretch the tape measure across the general waist area and move the tape measure up and down until you find the smallest measurement. Like the bust measurement, double the length across the garment for the full waist measurement. I find this to be the trickiest measurement. It’s not necessarily the widest point because that won’t work for A-line profiles on skirts and dresses, but it’s obviously not the smallest point either because that will typically be the waist. If you can fit into the garment, try it on and find the point where it falls on your own hips. Then measure across that point and double the number for the final measurement. If you cannot put the garment on, then do your best to eyeball where the waist would be. This is definitely when you want to use the word “about” when you describe the measurement. You can measure the rise on pants from the top of the waistband to the crotch seam. 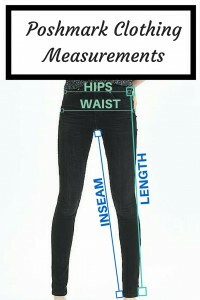 This measurement would be taken from the front of the pants. The pants inseam is asked for pretty frequently from buyers who know their measurements. Measure down the inside seam on one leg from the crotch seam to the bottom of the hem. You can either measure every garment as you list it, or you can provide measurements when they are asked for. Since I am usually crunched for time, I don’t take measurements until someone asks for them. However, if you do listing marathons and list tons of clothes all at once, you may find your time is more streamlined when you take the measurements up front. You might as well if you already have all of those clothes out. Another disadvantage to measuring clothes on demand is that a buyer will have to wait for your response if they ask while you are not at home. There is the risk of forgetting and the buyer might lose interest or find something else to buy in that time. It’s really up to you when you choose to measure your Poshmark listings, but now you know how to do it accurately! ← Can I Delete a Comment on Poshmark? I love the color scheme of your website. The pastel colors are beautiful and eye catching.It is feminine and clean. This is the first time I heard about Posh, but I am interested in downloading the app. I love the video that explains the what, and the how. This website will go places.Best success to you! Thanks Angela! I’ve absolutely loved using Poshmark…both buying and selling on it! New follower here (love you blog by the way)!!! Have you ever had to give measurements for shoes? I had a customer ask about the measurements for some heels and I was completely lost. I have a pair of cute shoes from ASOS, which are a U.K. Size 3/US size 5, but the measurements say otherwise. I’m sure that I measured them wrong lol. Could you possibly give me some tips. Thanks for checking out the blog! I have had to give measurements for shoes, and yeah, they’re kind of tricky! One option is to use a flexible seamstress tape measure to get the insole measurement. That way, you can put it right into the shoe and measure from the toe to the heel. Sometimes the angle/heel height can make that insole measurement slightly different for different shoe sizes. And for measuring heel height, make sure to subtract the height of the platform if there is any or state it as a separate measurement. Another option is to see if ASOS has a sizing guide that you can point a buyer to. Awesome! I’m going to have to check that tool out.